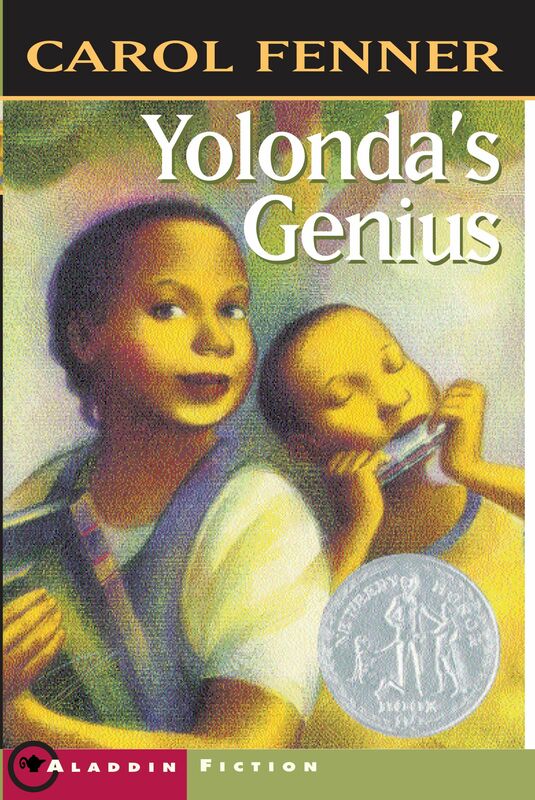 Fifth grader Yolonda determines to prove that her younger brother is not a slow learner but a true musical genius in this Newberry Honor Book from Carol Fenner. Yolanda is smart, tough, and big for her age. Back in Chicago where they used to live, everyone knew better than to mess with her or her little brother, Andrew. Andrew doesn’t talk very much and he can’t read, but he can create unbelievable music on the old harmonica their father left him. When Yolanda reads the definition of “genius” in the dictionary, she knows it describes Andrew, and she’s determined to convince the world, especially their mother, of Andrew’s gift. Then one day when Yolanda’s back is turned, the unthinkable happens, and the music stops. Now Yolanda’s mission is more important than ever. How can she open people’s eyes to Andrew’s talent and help him find the music again? Recently uprooted from her beloved Chicago, Yolonda is bigger and stronger and smar ter than all the fifth-graders at her new school in Michigan. She’s not a genius, but her little brother, Andrew, is. At least that’s what Yolonda decides when she hears the sweet roll and pitch of Andrew’s harmonica-playing. Other people, even her mother and her glamorous Aunt Tiny back in Chicago, aren’t so sure. But Yolonda believes that people don’t really take the time to listen to Andrew. They just think he’s a quiet first-grader, a slow learner. She knows it takes an attentive ear to hear Andrew’s genius. So Yolonda hatches an ambitious, audacious, and completely satisfying plan to get her family, and thousands of others, to tune in. 1. Yolonda longs for Chicago when her widowed mother moves the family to a smaller town in Michigan. Discuss the pros and cons of that move. What are some of the dangers that the family leaves behind? What are some of the pleasures? Do you think Yolonda’s mother made the best decision for herself and her children? 2. Remembering the Chicago girls who jumped double Dutch so deftly, Yolonda “liked to pretend those girls were her friends.” Why did she have to pretend? Why was it difficult for Yolanda to make friends in Chicago? Why is it difficult for her in Grand River? 3. Yolonda’s mother’s idea of a great place to live “included fresh air, peace and quiet, and trees.” How does that differ from Yolonda’s own idea of a great place to live? What is your idea of a great place to live? 4. Yolonda and her family leave a nearly all-black neighborhood in Chicago for a much more integrated one in Michigan. How does this change in racial environment affect Yolonda’s behavior in Grand River? How does her understanding of what is a “black thing” and what is a “white thing” shift as the novel progresses? 5. Even though she’s taunted for being overweight, Yolonda loves to eat and she doesn’t apologize for it. Discuss how the author portrays some of the positive aspects of being large. Pay particular attention to the way she describes the movement and carriage of Yolonda and her Aunt Tiny. 6. When Aunt Tiny transforms Yolonda’s mother with a “flirty” haircut, Yolonda is first shocked by and then proud of her mother’s glamorous new look. For the first time, she realizes her parent is more than just “a mother and a businesswoman.” Have parents or other important adults in your life ever pleasingly surprised you with new aspects of themselves? How? 7. Although academic success is commonly thought to be the measure of intelligence, there are, as Andrew’s musical abilities make clear, many ways to be gifted. Devise your own definition of intelligence. Would it include such accomplishments as musical skills, mechanical prowess, or a talent for making friends? 8. “You have to be pretty smart to recognize a genius,” Yolonda says. Yolonda’s mother and her Aunt Tiny are also very smart, but they are slow to recognize Andrew’s genius. Why? 9. Imagine that twenty years have passed since Andrew first stepped out onto that stage in Chicago. Where is he now? Is he still performing? What career has Yolonda chosen for herself? 1. Andrew is a musical prodigy, a child who exhibits extraordinary talent for performing at a very early age. Research other child prodigies—historical figures like Mozart or such modern day phenomena as Stevie Wonder, Michael Jackson, or the cellist Yo Yo Ma. 2. You are a reporter on the scene at Andrew’s remarkable debut in Chicago. Write the story for your newspaper, radio, or TV station. 3. Attend a blues concert or stage your own Yolonda’s Genius blues festival. Many recordings of the musicians mentioned in the book are widely available. Assemble your own tape of such performers as B. B. King, John Hammond, Taj Mahal, and Koko Taylor. 4. Using Yolonda’s impressions upon returning to Chicago as an inspiration, write from memory about a place you’ve been away from for a while. Then return there and compare you recollections to what you see. 5. Andrew can imitate the sounds of ordinary life—bacon sizzling or voices calling—and transform them into music. Try to do it yourself. Using basic instruments—a homemade drum, a harmonica, a simple pipe—try to recreate both the loud and soft sounds of your everyday environment.